I never really set out to get bit by the travel bug. After all, I applied to only English speaking countries when I applied for exchange in university. As a last option, I put down Sweden as my Dad went there a few times and spoke really highly of it. Guess where I ended up….Sweden! After spending six months there in an international residence with students from around the world, I was hooked. I ended up meeting my future wife while on exchange and we continued to travel around the world together ever since. We’ve travelled on every mode of transportation with both multiple allergies and celiac disease, and have now been to 4 continents. I get asked quite frequently “how do you manage travelling with food allergies”, so I thought I would write one comprehensive article that I can link to in the future versus short FB messages etc. Disclaimer – These tips are coming from an allergic adult male. I don’t have children and my strategies work for me. If you are looking for more tips on how to travel with children with food allergies, I highly recommend looking at FARE’s resources as travelling with kids is an area I am not remotely familiar with. Thanks for understanding! My trips literally just “pop up” and it’s rare that I am ever aware of a trip more than 6 months in advance. I don’t go overboard with advanced planning, but it is very important for me to get a sense of comfort for where I’m going. What does this involve? Google. I Google allergy-friendly restaurants, places that serve gluten-free pizza for instance. I Google the local emergency number (911 is not worldwide). I Google what the local traditional recipes and dishes are so I’m already prepared when I encounter a menu with confusing items. Buy a travel book, ask on an online forum – just get a good overall feeling for the food and allergy scene in that country. I also highly recommend www.allergytravels.com where you can read reviews, tips and more on a country by country basis. This is a given, but still important on anyone’s list who is travelling with food allergies. I have heard horror stories about the costs incurred after seeking medical attention for a reaction. Personally, I would never want the thought to cross my mind that I simply can’t afford to get a serious anaphylactic reaction treated properly. Get insured! I use American Express travel insurance for every trip. I am flexible with this as I believe most places should be okay. I do prefer however having my own kitchen that I can cook my own food in. Not only does this help with budget (restaurants get pricey on vacation! ), but I’m also a really hard person to feed for breakfast because of my serious egg allergy. I love breakfast at home. I really enjoy using www.airbnb.com to find accommodation in a more house/apartment style. If travelling to a foreign country with a foreign language, I strongly recommend getting an Allergy Translation Card made in advance. Do NOT get your translations through some free app or online tool. They are riddled with errors and I want to be taken seriously when I try to communicate my life-threatening allergies in a restaurant halfway across the world. I print a couple copies for my wallet as well as save the image on my smartphone. I then study these new words and become familiar with them and check for them on ingredient lists. Does that mean bring a whole suitcase full of food? Well…sometimes yes! I travelled to China last summer and did exactly that. I had little confidence that I would find much to eat through my initial research (see tip 1!) 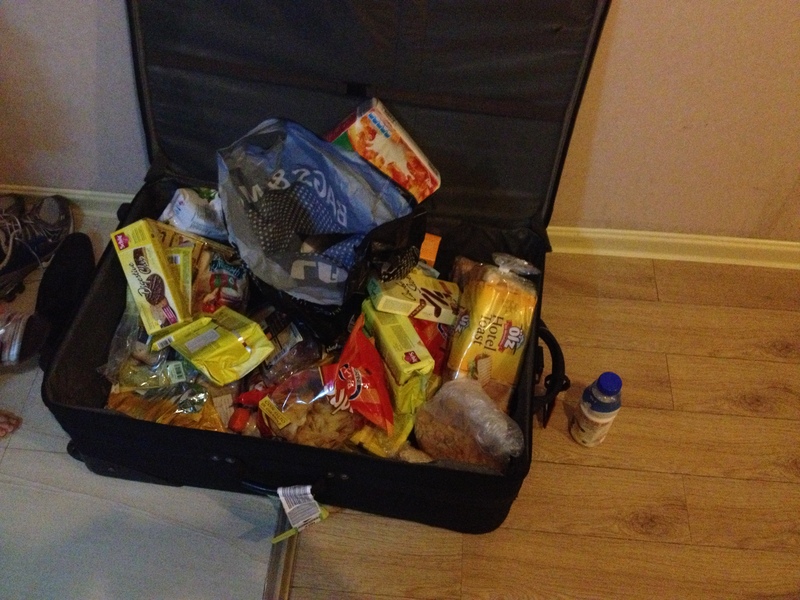 so played it safe and brought a full suitcase full of food for a 3-week trip. When I arrived I was so glad that I did. 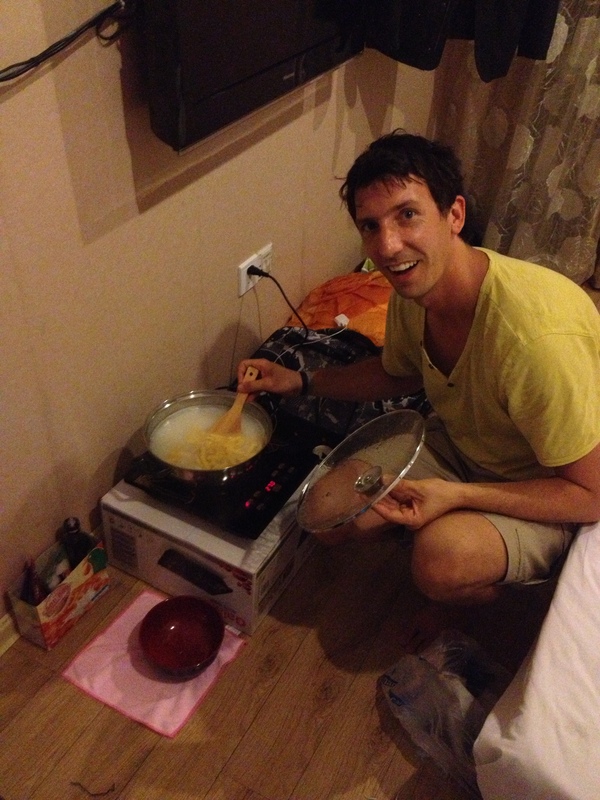 The first day I bough a hot plate and cooked nearly all of my meals on the floor of my hotel room (a lot of rice and pasta). Doesn’t seem glamorous does it? That’s fine by me – travelling is not about food for me – it’s about culture, museums, landscapes, people and the local wines and beers 🙂 I also always have a lot of small portable snacks like granola bars that keep me going on day trips. I stick with what I know when travelling and usually take a step back to get back to basics. I visit the local supermarkets and purchase meats, fruits, veggies – things that you find on the outer ring of the grocery store. I speak with the people who make the bread on site and cut the meat. It’s comforting. For fast food, I’m a sucker for McDonald’s. I’ll admit it. It’s consistent and safe. I know there are healthier options, however I love their salads and treat myself now and then with some fries or a burger. This is different for everyone so it’s hard to give too much advice here. I will focus on the absolute musts – ALWAYS bring extra epinephrine and NEVER eat the airline food. I pack an amazing lunch/dinner for myself and don’t feel like I’m missing out at all. Don’t take the risk! There are many other things you can do in terms of requesting a buffer zone with some airlines, wiping down your tray table, sitting on a sheet and more. Check with your airline in advance to see if they have a specific policy. As an adult male who has flown dozens and dozens of times, I am okay with a more minimal approach. I have had passengers beside me bring out bags of peanuts, and I simply asked them to refrain and offered to buy them a drink. This happened on a couple occasions and they were more than happy to help, and didn’t even take me up on the drink offer! We ended up having great conversations about allergies afterwards during the flight. Tip # 8 – Wear MedicAlert I.D. I wear my allergies on my sleeve, literally. My MedicAlert bracelet is a staple on me when I travel. I like that it lets others know that I have a medical condition, but I especially love that paramedics are trained to look for this, and it has an international toll-free number where they can access my medical records. Isn’t that cool? And I love the different styles offered – I personally rotate through a dog tag necklace and a leather cuff. Check out www.medicalert.org or www.medicalert.ca. Tip # 10 – Have an Amazing Time! The best part about really planning ahead and having all of your details figured out before you leave, is that you can really enjoy your trip once you’re there versus worrying all the time! Don’t let allergies slow you down! Don’t let food rule your trip. Eat unhealthy for a week if that’s what it takes – just don’t let allergies ruin your trip of a lifetime. Enjoy all of the amazing things that other countries and cultures have to offer – and remember to share how you did it to the food allergy community afterwards. The more we share, the smaller and more allergy-friendly this world becomes. You can leave your country review for others at www.allergytravels.com. Do you have any additional allergy travel tips? Please feel free to leave as a comment below. I would love to hear from you! It was a really hot day and we wanted to chill out in an air conditioned cafe. 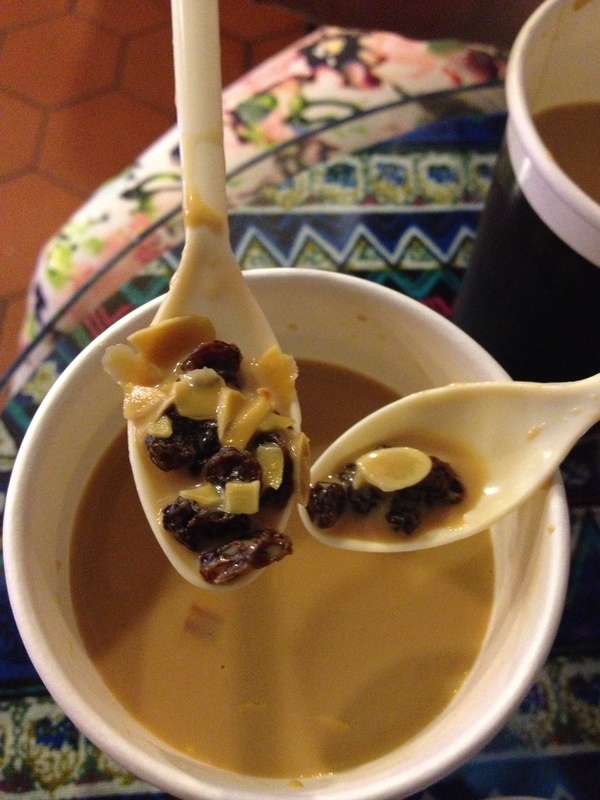 The big speciality of the cafe was milk tea as they brewed their own special mixture. From what I had heard, milk tea was no more than tea…with milk. Seems simple enough. I decided that I would go for my first glass of the stuff to say that I at least tried something other than Coke while in China. We ordered the drinks and received take-away cups with lids. With all of my allergies, I am the type of guy who always checks within a hamburger bun, a sandwich, or any food that has hidden layers. Being allergic to nuts, mustard and eggs has made me paranoid about condiments – especially mayonaise. But for drinks, there is usually nothing to be worried about right? Well I decided to be extra safe and open the lid off of my drink and stir it around with my spoon. I noticed a thick layer of stuff at the bottom of the cup. I scooped them up and found spoonfuls of almonds and raisins. She had both milk teas that day and I had a powerful reminder that there is nothing wrong with being overly cautious about what’s in your food and drink. Xiamen, China. Our home for three weeks. When my wife and I decided that we would go to China, the main focus soon turned to making a plan to eat safely there for three weeks. We knew it would not be easy for either of us. She has celiac disease and was primarily concerned with soy sauce as we heard it was used in so many dishes. I am allergic to peanuts, tree nuts, eggs, fish, shellfish and mustard – not an easy list to manage at home, let alone in China. Along with purchasing some health insurance, our pre-trip planning included buying a full suitcase full of safe food, and printing Allergy Translation Cards that featured all of our allergies in Simplified Chinese. We had low expectations of finding many safe options at restaurants, so were prepared to eat out of our suitcase for three weeks as a worst case scenario. Arriving in China was surreal. We have never felt so foreign, which was a intimidating, yet exciting feeling! 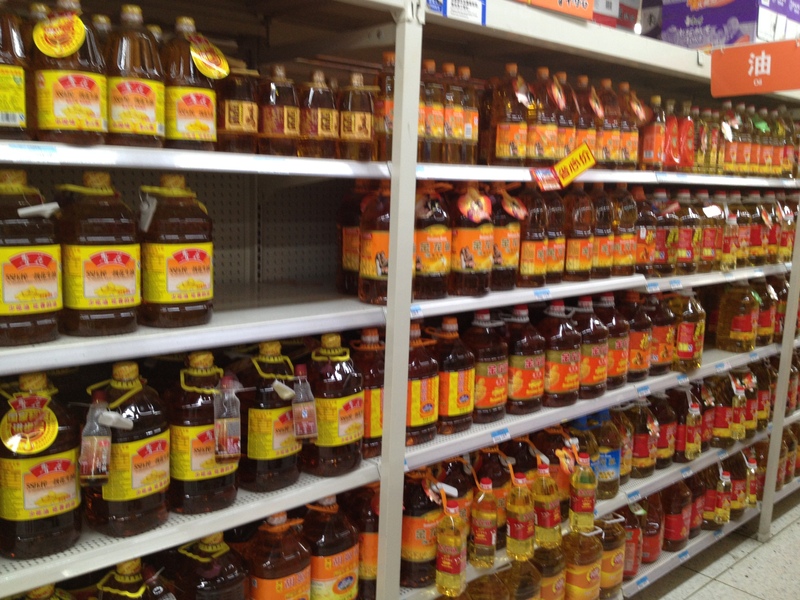 On our very first day we discovered a Wal-Mart in our city and had our first Chinese shopping experience. We did not know what many of the items were as they did not have English on their labels. Even the pictures were of things we’ve never seen before. We went through the grocery section and bought milk, a bag of rice and some imported pasta sauce for the gluten/egg free pasta we brought from home. We then bought a hot plate for about $20 which was worth every penny…or yuan. As we walked around the city, we peered into restaurants and their picture based menu boards out front. In most cases I could not identify one thing that I could eat, except a plain bowl of rice or grilled meat (however I was too worried about cross contamination to order this). I should note that we were on an island, thus there was an abundance of seafood which is one of my allergens. 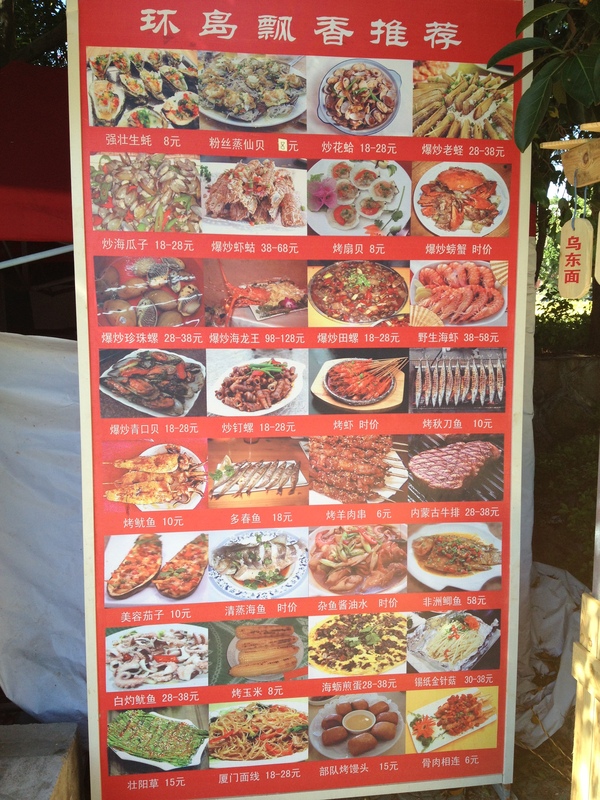 The rest of China may be different culinary experience. However, we learned early on that we would not be doing much dining out. Our typical day included all 3 meals at home. Not much of a variety, but it kept us full and safe. We would watch episodes of Breaking Bad on my iPad for dinnertime entertainment. Is it obvious that we did not come to China for the cuisine? Cooking away on our hot plate in our hotel room. We ate out at restaurants on four occasions. Twice at the same place, which was a nice little spot tucked away in a busy marketplace. We noticed it had an English menu out front – which was pretty rare in our city. It had pizza on the menu as well as some salads that seemed okay for my wife. 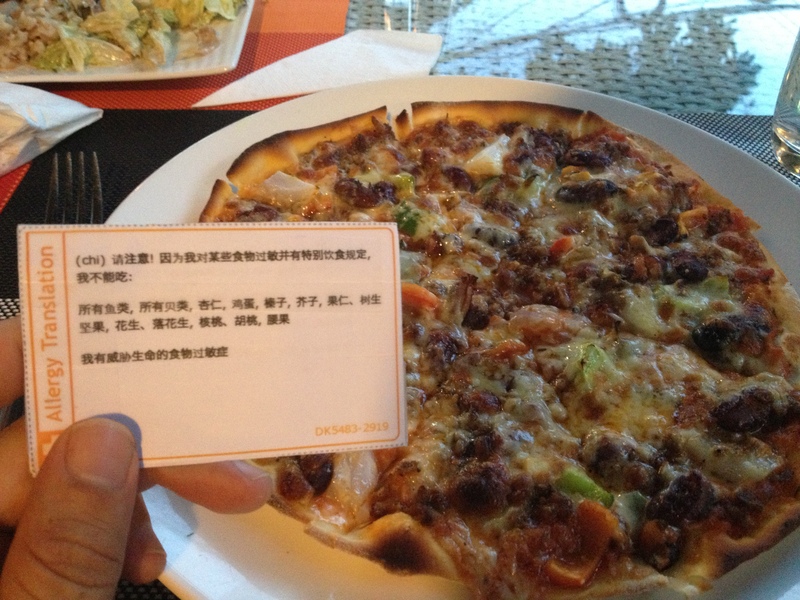 We pointed to the items we wanted on the menu and then handed over our Allergy Translation Cards. They read them and understood our restrictions and told us it would be okay. I ordered a Mexican pizza which was delicious. We came back to this place two weeks later and ordered the exact same meal. We found a Texas Bar & Grill on our island that seemed too good to be true. They were even playing country music! The owner was American and helped ensure that our meals would be safe. 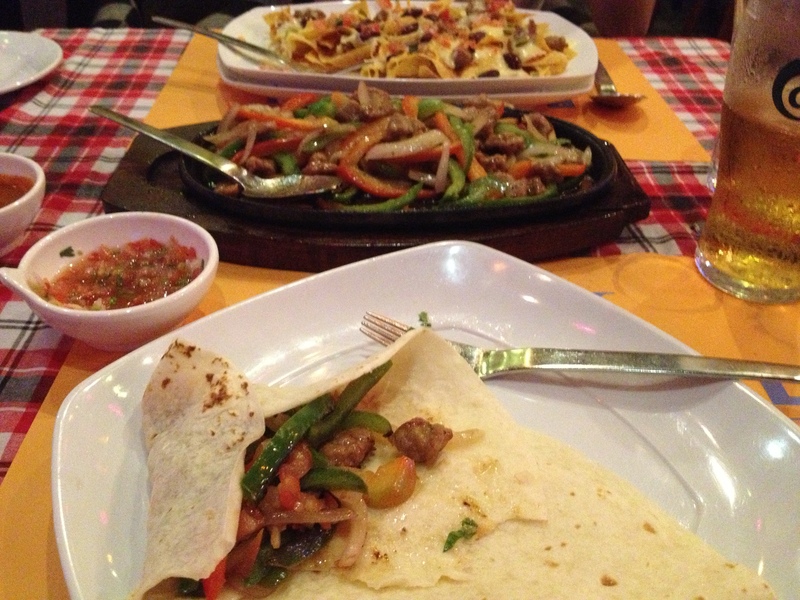 My wife ordered nachos and I had fajitas. What a great taste of home! The other restaurant was….Poppa John’s Pizza! It almost seemed like a mirage, especially since we were on a small separate island called Gulangyu. The pizza I ordered was tasty and safe. 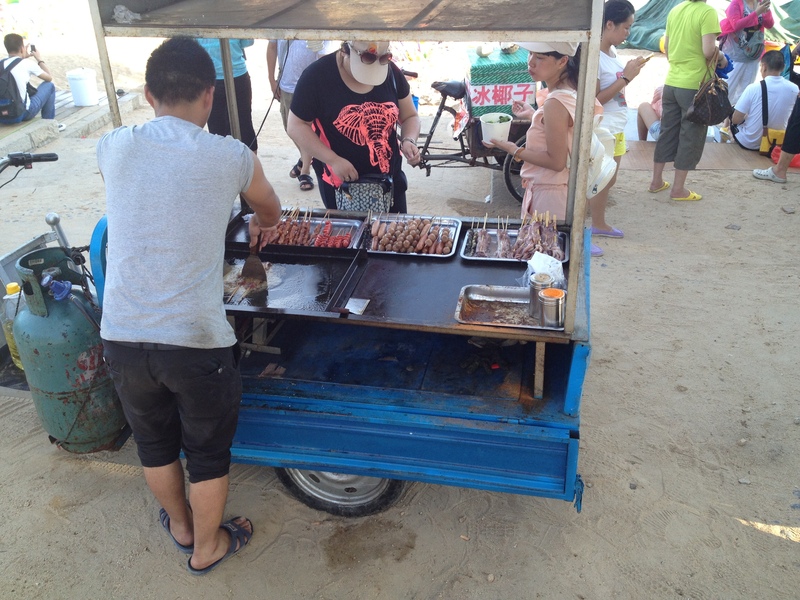 The typical “fast food” consisted of road side carts frying up meats on a grill. This looked promising at first, however all of these grills cooked seafood too, most commonly squid on a stick. We avoided these all together and instead went to McDonalds on a couple of occasions. They did not speak English at McDonalds, so they always gave us a picture menu to point at the foods we wanted. I always stuck to a hamburger with fries, but the challenge was conveying that it could not have mustard. They did not understand the word mustard, but they knew ketchup. So I would point and say “yes ketchup”, followed by “no yellow”. It worked every time except the one lunch where I just received a plain patty on a bun. No problem, can’t be picky! We were lucky that we got to see China, however we realized that we missed a large part of their culture by avoiding many dining out opportunities. However, we made up for it by visiting many local cultural attractions such as galleries, museums and temples. We rode the bus all over the place to really see what local life was like. It’s fun to discover all of the other amazing things that make a culture unique beyond food. We are so thankful that we got the opportunity to see all of the amazing cultural aspects of China and hope to visit again someday. I did have one close call while in China, but thankfully had no reaction. I will save that story for another day. 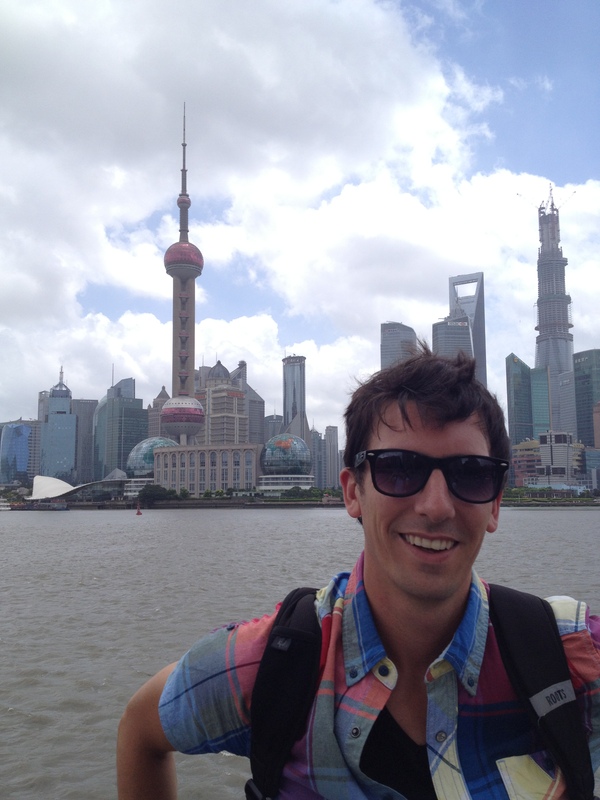 Seeing Shanghai was a highlight of our trip. Only two more days until I leave for China. I am beyond excited at this point! 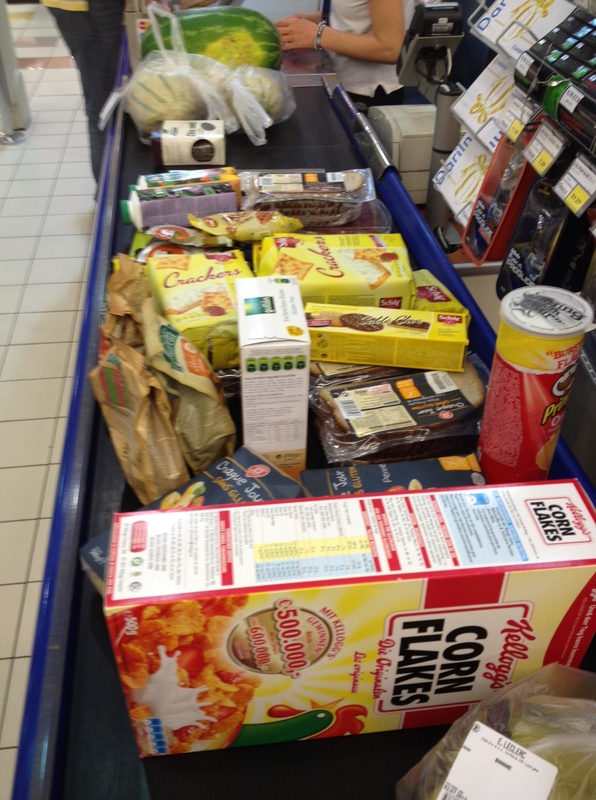 1) Grocery shopping – we stocked up on a lot of food. I think we will will fill a full suitcase. Between my wife’s gluten-free products and my go-to foods, we grabbed a lot of dry goods like pasta, cereals, cookies, crackers, chips and a few candies too! We also got many safe spice mixes so we can whip up easy meals in our hotel room using a grill (which we hope to purchase right away). 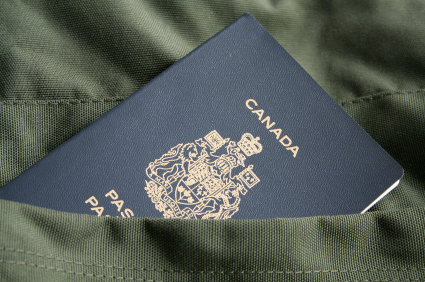 2) Insurance – I’ll admit that I got this a few weeks ago as it was needed to apply for a travel visa. However, we made sure to get a folder with all of our essential travel documents so they are easy to access. I have never needed to use my travel insurance before, and I hope it will stay that way! 3) Allergy Translation Cards – My wife and I have our individual cards from www.allergytranslation.com and a chef sheet explaining cross contamination in Simplified Chinese. 4) Medicine – I’ve got all of my auto-injectors ready to be packed in my carry-on. I always keep my essentials with me at all times. I will also have some food in my carry on in the case our luggage doesn’t make it right away. I got my travel bug when I was 20 years old. I went out of my comfort zone and applied to go on international exchange through my university. I chose all English speaking countries as options except one. Guess which one I got – Sweden. Looking back I feel it was fate. It was an incredible experience and changed my life in so many ways- not to mention the place where I met my wife. Since then, I have been fortunate to travel to many countries in Europe. I’ve been able to manage my allergies on all my trips and have never let them slow me down. However, there is one area of the world that has always made me nervous to travel to – Asia. From everything I’ve heard, and pictures I’ve seen, I know it’s a beautiful area of the world. However, I’ve also heard that it can be a difficult place for someone with food allergies to eat safely. I’ve been to a Chinese restaurant on only a handful of occasions in my life and know that my options are limited – especially with peanut, tree nut, egg and seafood allergies. 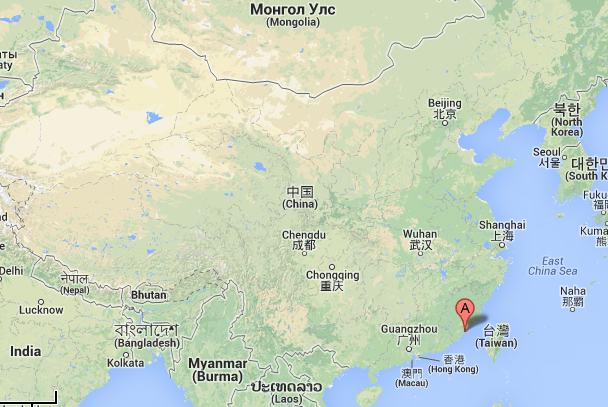 But yes….I’m going to China. For 3 weeks too. Over the past month I have been doing a lot of research for the trip and have slowly become very excited! Now that we are a week away from departure, I can’t believe how much I’m looking forward to the whole experience. I feel comfortable knowing that we will be bringing a lot of our own food and plan on buying a grill and slow cooker for our hotel room to avoid dining out. The adventure ahead has mostly made me excited to prove that such a trip is doable for people with multiple food allergies. It might not be easy, it might not be conventional, and it might not be convenient – but I am going to China and am determined to find ways to have a fun and safe vacation! I will keep you posted with my preparations for the trip. I hope this blog can be useful for others with allergies planning a trip to China. I’m not sure how much I can post once I’m there due to the possibility of Internet censorship (I believe no Facebook), but will post a full recap afterwards.